Keeping up with the Joneses is bad. We know that. From a financial perspective, we spend a great deal of our time overcoming the green monster called envy in order to keep our lives in some semblance of financial order. We know the Joneses down the street with their big, fancy new SUV. We see them going on long family vacations. And we know the guy that mows their lawn. But, we also know that there’s a pretty high probability that they still owe a ton of money on that SUV. That that family vacation likely was financed through a credit card. Their entire financial life depends on them keeping their well-paying jobs. I’d like to talk about another family. The Smiths. You don’t know them. We don’t talk about them like we do the Joneses. Why don’t we? Because, outwardly, their lives are nothing to be envious of. They don’t own a big house on a double lot. They don’t drive a brand new Escalade. Their family vacations consist of weekend trips to state parks or trips to visit family a couple of counties over. Outwardly, they may even seem a bit downtrodden. They may seem (GASP!) a bit poor. Sometimes they are. Sometimes, they are truly victims of their circumstance, or their poor financial choices along the way. But, for every one of those families, there’s at least two that aren’t poor. They have well paying jobs. They have money in the bank. And they occasionally barbeque a steak on the cheap grill they have on their back deck. It’s those Smiths I’d like to talk about. Why don’t we know the Smiths? Because we live in a society that is enamored of our celebrity. We hang on every word that that famous athlete, or famous actress says. We try and model our lives after theirs. They live a glamorous life, full of flashing photography, red carpets, and any number of endorsement deals. Who wouldn’t want to be like that? Short of being famous, we decide that we’ll see how close we can get. The bank doesn’t turn us down for that big house, big car, or vacation to the same beach that the celebrities hang out on. Maybe we’ll even get to see one of them! But, it’s the Smiths we should know. We should know people who live their lives responsibly within their means. We should know people who live for more than having our fellow neighbors think about how rich we are, and how rich our lives must be. We should be the Smiths. We should be the people who drive the reliable older car without the flashy rims and booming sound system. We should be the people who live in the smaller house that we try and repair ourselves. Society may push us towards that Joneses sort of lifestyle. After all, what would become of some of the companies if we stopped trying to keep up with the Joneses and stopped buying all their luxury goods? What would the news and tabloids cover if we weren’t constantly buying their rags in order to find out what sort of clothes the princes and princesses of some foreign country were wearing this spring? All around us, there are Smiths. We don’t notice them, and we rarely get to know them. We’re surrounded by the Joneses, and the shiny facades of businesses and economies that are driven by their reckless spending. But, under those shiny facades is a crumbling foundation. The economy of the world is on shaky ground. We saw just how shaky it really was in 2008. When the housing market crashed, it very nearly brought the entire world economy with it. Luckily, the economy was strong enough at the time to take a beating. It wasn’t strong enough to bounce right back. It’s been a long slog back to where we were. We aren’t even back there yet. There are still parts of the world that are hurting economically. Imagine, for a moment, if we rebuilt that economy, not on the sands of bailouts and extended unemployment benefits, and instead built it on the bedrock of hard work and frugality that got us where we were in the first place. Imagine if we had seen the folly of our loose spending ways and tightened our belts, stuck to our budgets, and started building an economy that doesn’t shake and quiver at the smallest rise in unemployment, or the slightest miss in an earnings report? What if, instead of running around willy-nilly chasing the lifestyle of the Joneses, we were calmly working ourselves into the stable economy of the Smiths? What if we all didn’t have wait for our next paycheck to buy gas because our last paycheck went to our mortgage and car payments? What if we were able to fill a tank of gas from the cash in our bank account and know that we still had our emergency funds to help us along should a real emergency come along? We can. We can bring our spending in line with our earning. We can sell the fancy car that we don’t need. We can downsize our house to something that we can afford. Sure, the dependable used car you buy might not have as much chrome as the fancy one. It might not have the same heated seats. And the house you downsize to might not have a walk-in closet, or a jacuzzi bath tub. I’ll let you in on a little secret. You don’t need them. They’re luxuries. You only think that it’s normal to have those things because the Joneses told you it was. 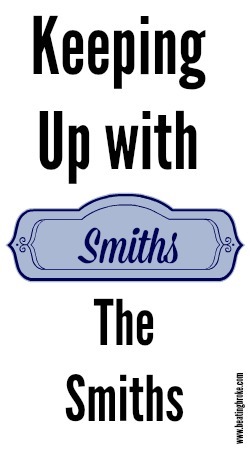 We should be keeping up with the Smiths. We can be the Smiths. Life insurance seems like a second thought to so many people. You’ll notice that the title of this article isn’t “Do I Need Life Insurance?”. That’s because there really isn’t much question about whether you need life insurance or not. I suppose there might be a few exceptions, but pretty much everyone needs and should have life insurance. It’s just a matter of how much you need. There’s a couple of ways to figure out how much you really need. This is probably the most popular method of choosing life insurance. And it’s completely wrong. If you ask most people how much life insurance they can afford the answer is almost always “little” or “none”. Again, wrong answer. Most of us carry car insurance because it’s something that covers us against a loss. If our car is damaged in an accident, we have the insurance to help with the cost of repairing or replacing the car. To the people who depend on us for income, we need to have life insurance in place to help with the costs of continuing on when our income is lost. How much income do I need to replace? This question is usually a pretty good place to start when determining how much life insurance you need. If you’re a regular budget-maker, you probably have a pretty good idea of how much income you and your family need to pay the bills and keep food in the fridge. It’s probably not your entire salary, but it might be close. Take into account any investments you have, as well as assets that might become unneeded if you die. You’re family probably won’t need that second car anymore, for instance. Also, any payments on those assets that can be disposed of can be discounted as well. How long do I need to replace the income? Once you know how much income you need to replace, the next question you need to ask is how long you need to replace it for. In an ideal world, you’d be able to buy enough life insurance to set your family up for life. Your spouse would be able to quit work and take care of the kids full-time. You’d be able to pay for the children’s college education. But, the world we live in is far from ideal. Most of us won’t be able to afford the premium payments on a life insurance policy that will pay out enough to do those things. In a romanticist world, your spouse would grieve for your loss for the rest of his or her life. That isn’t all that likely either. It’s far more likely that your spouse will remarry at some point. All of that still leaves us without a real answer to the time question though, doesn’t it? You’ll have to make some assumptions in order to really answer the question. Assume that your spouse will get remarried. Assume that you’re not going to be able to pay for your kids’ college education with the pay-out. I think a good starting point is somewhere around 3-7 years. Some will say that’s too long. Others will say that it’s too short. I don’t think there is a perfect answer. And, when you’re faced with a question that has no perfect answer, you’ve got to find an answer that is as close as possible. You’ve answered how much income you need to replace, and you’ve got a pretty good idea of how long you need to replace it for. Now, you’ve just got to put the two together and come up with how much life insurance you need. Multiply the income number by the length and you’re in the ballpark. Let’s say that you determine that you need to replace about $30,000 a year in income. You’re married to a real hottie, who shouldn’t have any issues with finding suitable future spouses, but you don’t want him or her to rush into it, so you use the 5 year length. $30,000 a year X 5 years = $150,000. You might want to add a bit extra for sudden expenses at the time of death, like funeral, casket, and burial. But, that’s a pretty good ballpark number for how much life insurance you should buy. Now comes the big step… You’ve got to purchase it. Find a good place to compare life insurance policies and costs and get all the information compiled. Then pull the trigger and purchase the policy. That will be the hardest part of the whole thing. If anything does happen to you, your family will be thankful that you did.